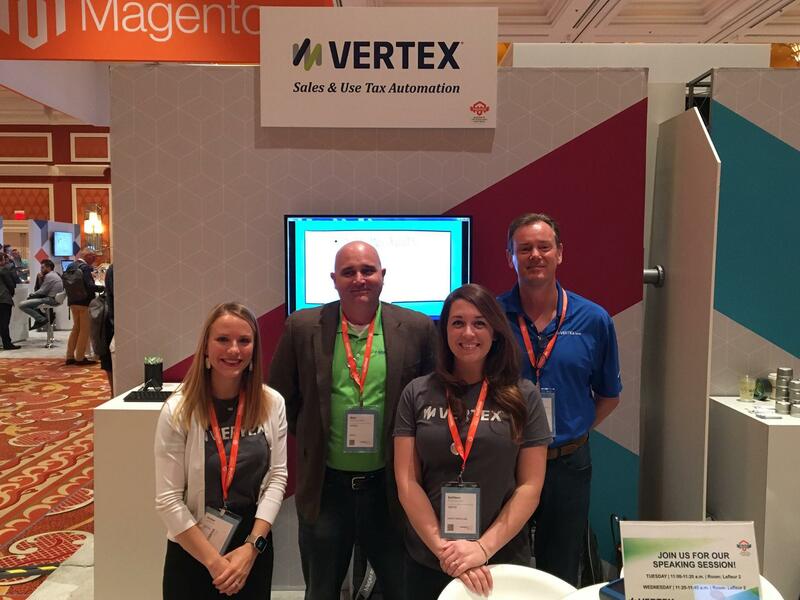 Although this is Vertex‘s first year attending PreImagine, they have had their partnership with Magento and offered simplified sales tax for Magento merchants for 3 years. They also had the wonderful opportunity to announce the signing of their Premier Partnership at last year’s Imagine event! Vertex provides cloud and on-premis solutions that can be tailored to specific industries for every major line of tax, including sales and use, income, value-added and payroll. Merchants faced with the challenges of selling online, can access the software directly from the Magento dashboard in order to automate their sales tax collections. 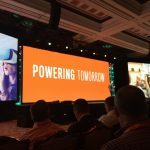 Erin Kissling, Partner Marketing Manager at Vertex, sheds some light on what it’s like to be apart of the Magento community and what they are looking forward to as PreImagine newbies this year. We are based in King of Prussia, PA right outside of Philadelphia where a majority of us will be traveling in from. I hope everyone is ready to hear about how proud we are of our recent Eagles Super Bowl Championship and debate about who has the best cheesesteaks. I will definitely be requesting “Motown Philly” at Pre-Imagine. We also have a few members of team traveling in from Georgia and Texas – we are working on converting them to Eagles fans. What does being apart of the Magento Community mean to you? Being a part of the Magento Community is truly unique and inclusive. I can honestly say that Magento and other partners have welcomed us with open arms to this ecosystem! We have not only been able to help merchants with their sales tax needs, but we have built friendships and comradery with others in the community. With so many Magento merchants powered by Vertex and the most recent core bundled integration, our Magento Premier Partner could not be more important to us. We are always growing and learning. Is there any one thing you would like to learn during the conference as a whole? I am always excited for breakout sessions that focus on the merchant perspective to learn about their view surrounding the checkout experience, site performance, and efficiencies. Hearing directly from merchants is always so insightful and allows us as partners to ensure we are providing them the most streamlined tax offering for their online store. Additionally I am looking forward to attending the payments panel and hearing what is new in the 2.2.4 release. How many years has Vertex attended PreImagine? How many as a sponsor? This is so exciting for Vertex because it is our first year attending and sponsoring PreImagine. Our team is looking forward to spending time with the community and partners. Why did Vertex decide to sponsor PreImagine this year? We have been so welcomed by Magento and other partners and felt like we wanted to support the community. Karen Baker was so nice to invite Vertex to participate in an Austin Meetup in February – everyone at the Meetup was raving about how great of an event it was. We wanted to support Karen and the awesome ShipperHQ team in their famous event! How Karen included us in the Meetup is a prime example of how welcoming this community is as a whole. What is your favorite memory from past PreImagines? We are looking forward to creating some this year! I can’t wait to have this answer ready to go for 2019. We are looking forward to networking with the amazing Magento community. I am really excited to see what swag everyone sends and what unique theme everyone comes up with. I am also excited to cut some rug and dance! Hopefully I will be physically able to still move after the Big Dam Run – TBD. We are looking forward to reuniting and networking with others in the community. We all know we will be swamped during the Imagine show, so it will be great to hear how everyone is doing and catching up! I am so excited to see other partners and Magento team members that I don’t get a chance to see often. It is always fascinating to me to network and learn from others in the community – I think sometimes it’s so easy to just focus on what your solution offers. It’s really great to be able to hear from other solution and technology partners about the value they bring to the Magento platform and the problems they solve for merchants. Since we are newbies, I do not have any advice but if anyone has any – email me! I am all ears! Are you exhibiting at Magento Imagine? If so, do you want to share anything exciting you have in store for people visiting your booth? Vertex is a proud Platinum Sponsor of Imagine and we will be at booth #421. Our booth is going to be full of fun people, unique swag, and all of the answers to your sales tax questions!